In addition to sending text messages, sharing photos is probably the most prominent uses case with messaging apps. Nowadays all popular messaging apps enable users to easily exchange single photos. The newer and better apps allow users to send multiple photos at once (Grouptime, Line, Kakao Talk). Grouptime displays the photos in large and without bubbles in the chat, so users can view them nicely and directly without the need to open single photos. If several friends post their photos to a chat, this creates a great album of an event or a party, and it is great to easily exchange photos with friends. Some apps enable users to add a caption (description) to a photo. Good examples are group messaging apps like Grouptime, Touch, Groupme. Messaging apps are pretty good for private location sharing. You simply select your location, and send it to selected contacts or a group of friends. Since finding one’s location with the GPS or network stations is not very accurate (sometimes it is half a mile/kilometer away from the real position), some messaging apps offer a selection of locations around the position user. These messaging apps use location databases like Foursquare or Google Places to offer a wide selection of venues. With Whatsapp or Grouptime the user can simply choose the location where she is at (e.g. shop or restaurant), and send it – automatically including the address – to her friends. This is also great for giving directions. Not a very prominent use case, but for those of you, who regularly need to exchange contacts from your address book, check out ChatOn or Line. In general, messaging apps are not really made for sharing moments. The bubble style chats are mainly good for texting. There are some messaging apps, that have started walls or news feeds for sharing similar to Facebook. However, you always share publicly with everybody. If you look for an app where you can privately share moments with selected people from your contacts, maybe Grouptime is something for you. 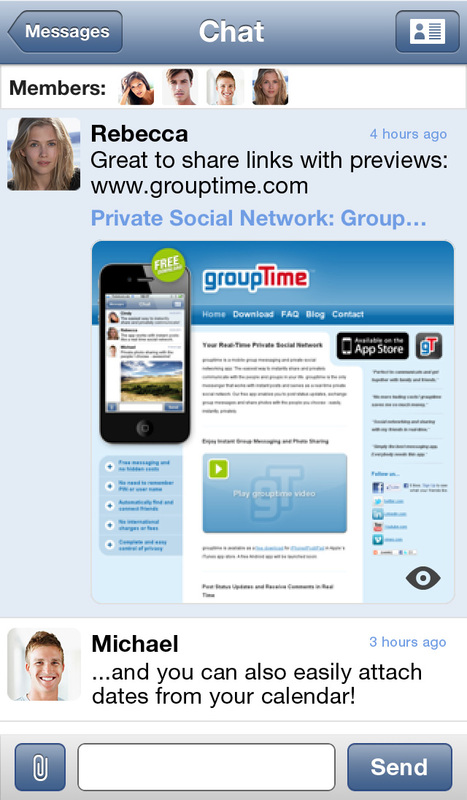 Unlike other group messaging apps, Grouptime works with instant posts like a private social network. For sharing moments with private groups like family and close friends the app is pretty awesome. Exchanging voice messages is mostly a standard feature of messaging apps in these days. Power users have turned to specialized apps like Voxer, which operate more like a walkie-talkie. Currently there are only two messaging apps that enable users to share dates from their calendar: Grouptime and ChatOn. We prefer Grouptime, because the group messaging and sharing capabilities are better to exchange dates. Nearly all messaging apps detect links in chats. However, most of them don’t offer any functionality around sharing links. If you want a preview of links or YouTube videos (like in social networks like Facebook), try Grouptime. In the near future the content sharing with messaging apps will offer better functionality and more content types (documents, drawings, music, etc.). In addition, we will see better integration into 3rd party services. Some of these upcoming features have already become visible in very basic versions in a few messaging apps. Still, this is just the beginning of content sharing with messaging apps.